If you attended our October Main Event in San Francisco, you’ll remember our Innovation Journey, a framework we developed to guide members through the six stages of program development, prototyping, and deployment (see below). As previewed by our kickoff event of the year, Crowd Companies will be broadening its coverage in 2016 to include additional topics that affect our innovative members. The council will continue to support its members as they deploy Collaborative Economy programs, while also expanding its focus to assist members as they adapt their business models to other tangential technologies that stem from these crowd movements. The first focal point you’ll begin to see content and resources emerge around is what we’re calling the “Autonomous World” where robotic hardware and software perform tasks once performed by humans, often using the same business models from the collaborative economy. In January, we’ll be hosting a member event where we’ll examine the impact of self-driving vehicles, drones, and artificial intelligence on all industries and society as a whole. Also release a research report for members and and a related infographic for public consumption. Finally, we’re pleased to announce the newest Crowd Companies staff member, Carl Bohlin, whose primary goal will be to understand our members needs, and strategically matching them to a variety of innovation resources that the council offers. Crowd Companies has over 200 members, spanning 50 companies, across multiple countries, as such, Carl will work with Angus on member success initiatives to assist the council in its growth along the Crowd Innovation Journey. He has more than 7 years experience in managing peer-to-peer councils at Forrester and Giga, and has a background in IT and financial services. Carl joins us on the east coast. If you work for a large company, and want to learn more about membership, please submit your details to our online submission form. 2015 flew by, and I’m looking forward to growing with you all in 2016. Let’s keep the momentum going. Cheers to you and your loved ones in a prosperous new year! In a recent webinar, I joined Andrew Reid, founder of Vision Critical, to discuss the new rules of the Collaborative Economy. The webinar explored three paths established companies can take to successfully compete with the likes of Uber, Airbnb and Instacart: through price, convenience and brand. 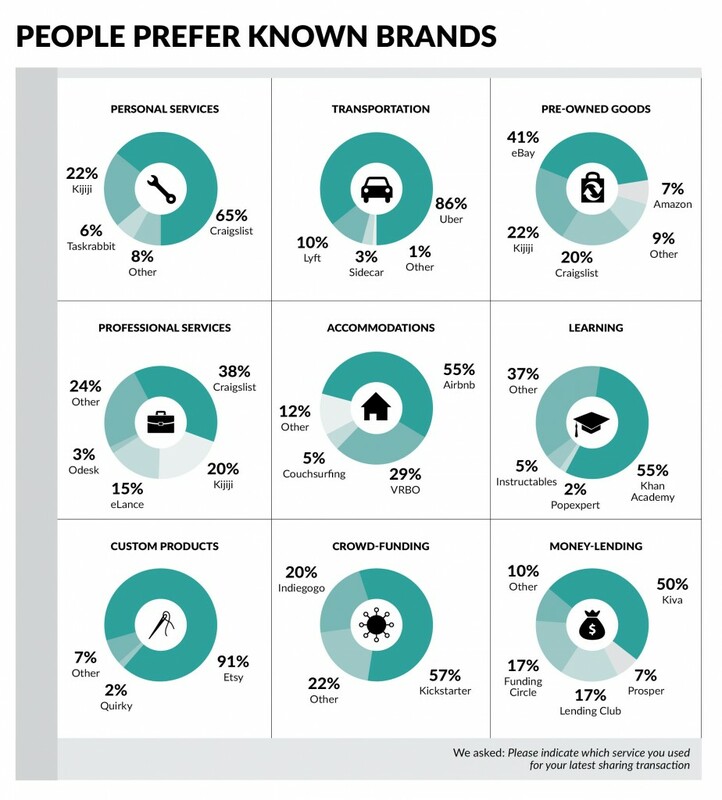 As we revealed in the webcast and in the accompanying report, brand is the most useful path for companies with strong brand recognition and positive brand sentiment. This is particularly true in markets where customers are sensitive to risk. This finding might seem counterintuitive. Afterall, startups—the small guys—have driven the growth of the Collaborative Economy. But our report, based on feedback from more than 50,000 North Americans, clearly shows that in almost all categories of the Collaborative Economy, a single player dominates the market. That’s why Uber is practically synonymous with ride-sharing, Kickstarter with crowdfunding and Airbnb with house-sharing. 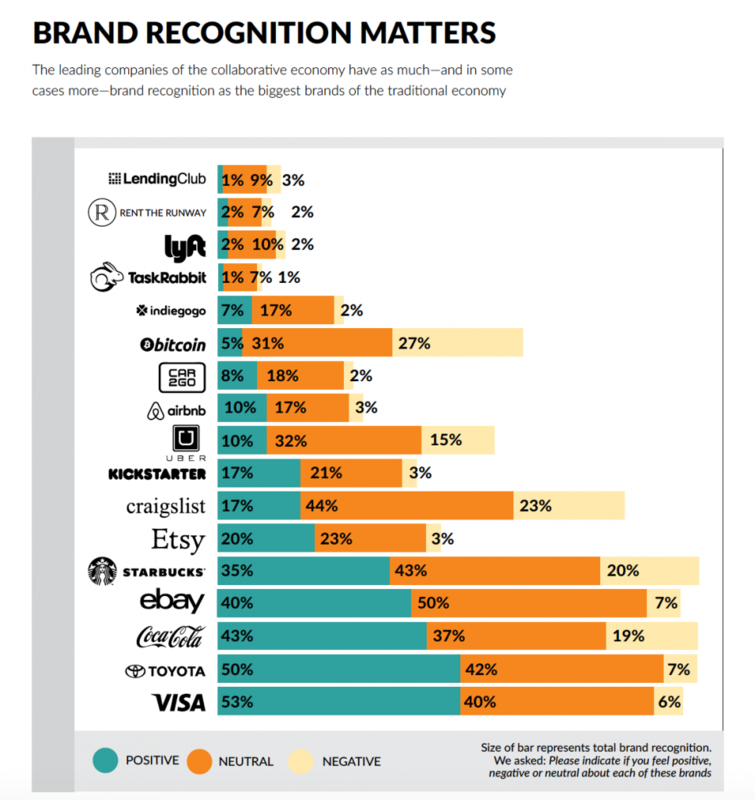 Positive brand recognition is huge for top players in the Collaborative Economy. For instance, more than 40 percent of North Americans have heard of market leaders like eBay, Craigslist and Uber. Many of these same players also have positive reputations, as the infographic below shows. In short, the scrappy innovative startups of the Collaborative Economy have become big brands themselves. The big lesson: your brand still matters in the Collaborative Economy. The rise of on-demand technologies doesn’t change the fact that brand recognition and market dominance are still closely related. In fact, across all age groups, brand is as important as convenience in determining whether a customer will consider sharing or buying. Brand trust determines whether buyers will choose traditional buying over sharing, and vice versa. The enduring importance of brands is good news for established companies. Here are three strategies for companies that want to take advantage of their brand name in the collaborative economy. Partner with companies that have strong positive brand sentiment. This provides a level of brand trust, which is useful in encouraging people to try your initiatives in the collaborative economy. Leverage your own brand to increase your collaborative capacity. Determine if your brand has strong positive recognition, and if it does, make sure your brand is front and center as you launch sharing programs. Focus on customer experience to build your brand. For companies that are already well known, providing a high caliber of customer experience assures the continued strength of your brand—a necessary step in attracting customers in an era of collaborative consumption. Engage with your customers frequently to identify ways of providing a more seamless experience, and build your brand over time using customer insight. For a deeper dive on the use of brand as a competitive advantage in the collaborative economy, watch a recording of the webinar The New Rules of the Collaborative Economy.